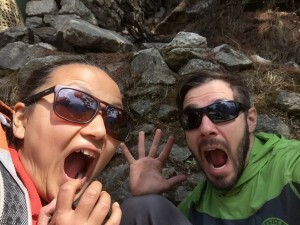 Home / Uncategorized / Day 3 – Altitude, Namche and the Dr. is in the House! 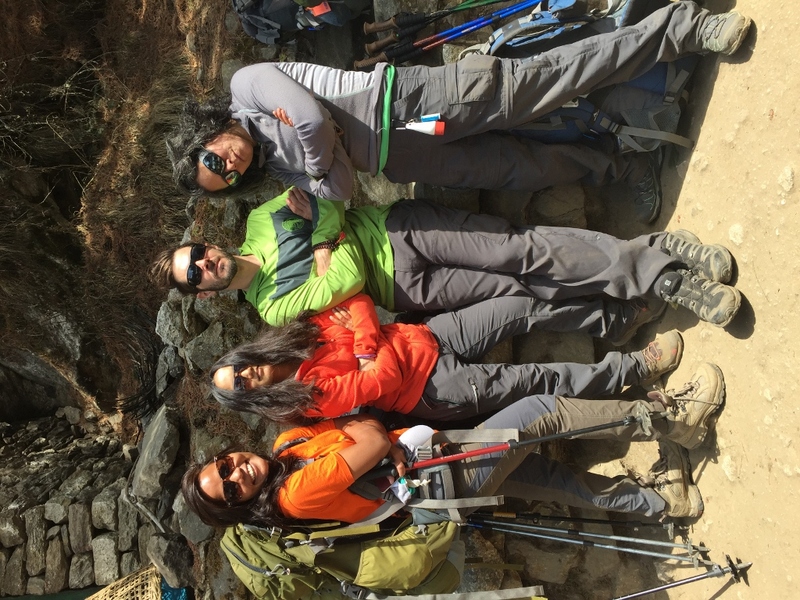 As all of us were finally united, it was exciting to make our trek from Monjo into Namche. 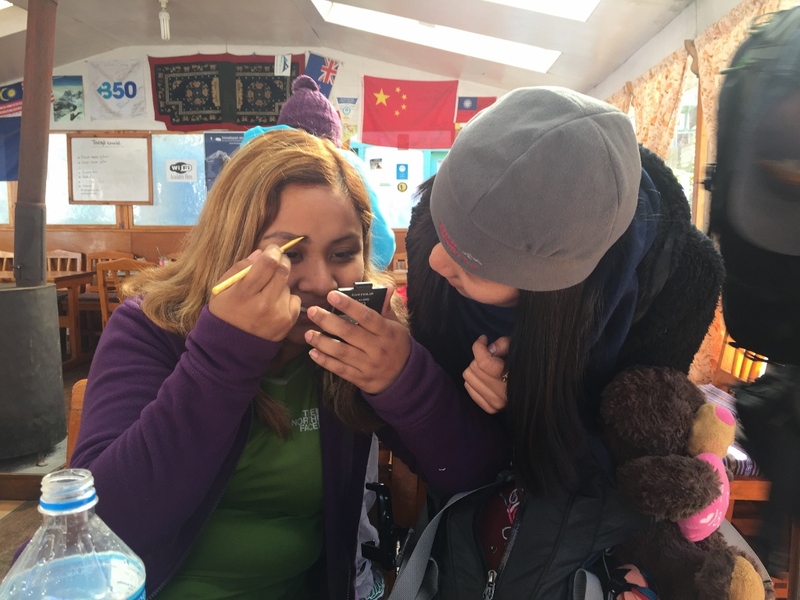 During breakfast the spirits were high as everyone felt a little more rested, Paola was teaching her new mentee how to properly apply make-up, and after that session we were out the door by 8:30am. 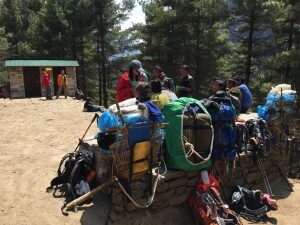 As we started the trek, the weather seemed to be cooperating. 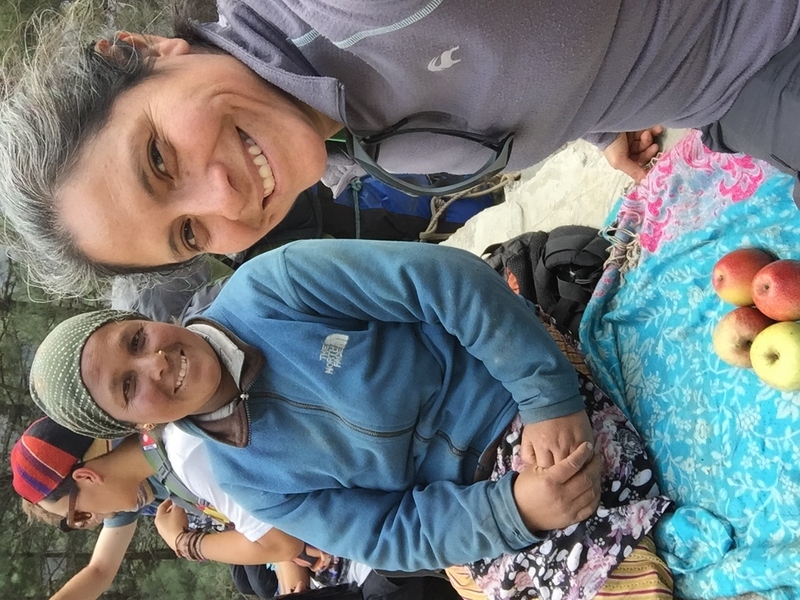 During our 2 previous days coming into Monjo, we were greeted by clouds and signs of rain. 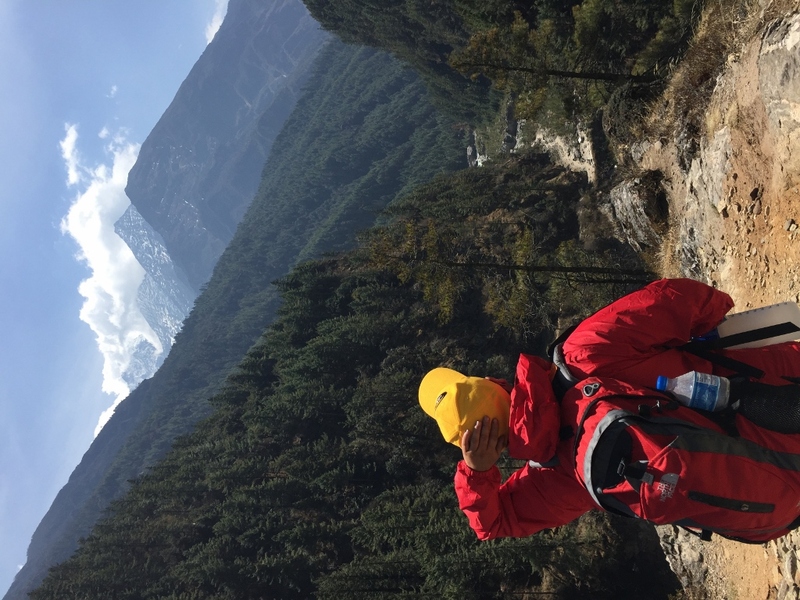 Though as the sun was bright, the brisk of clouds and wind hovered around us, and my biggest hope was for the sun to stay during our final climb into Namche. Within the first 10mins, we came across the entrance to the Sagarmatha (Everest) National Park which is also the official trekking office permit location. 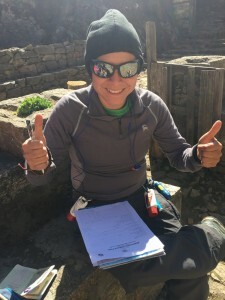 A trekking permit is massively different than a climbing permit, and given that I had my climbing permit, I was required to complete multiple forms. Asha stayed with me as the rest of the group continued. As I completed the various questionnaires, it hit me again, the seriousness of what I was doing. Looking at the same gates that I crossed back in October of 2005 without an ounce of experience trekking and to now see the contrast of 10 ½ years later filling out paperwork to get my confirmation that I’m one of the registered climbers attempting the opportunity of paying respects at the top of Mt. Everest. I got the chills while completing the information and felt in awe on a once in a lifetime opportunity to attempt something I never thought possible. 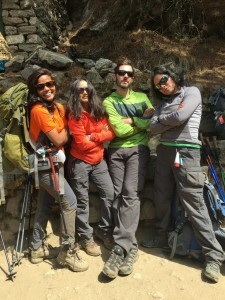 As my permit was confirmed, I big smile to Asha and then it was off for us to catch to the rest of the group. 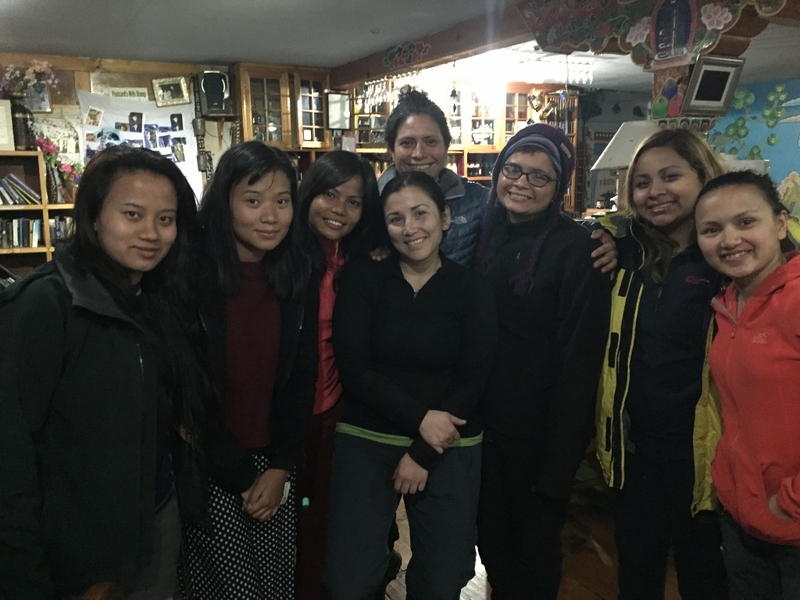 We caught up to the girls walking through the last town before the big climb into Namche Bazaar. 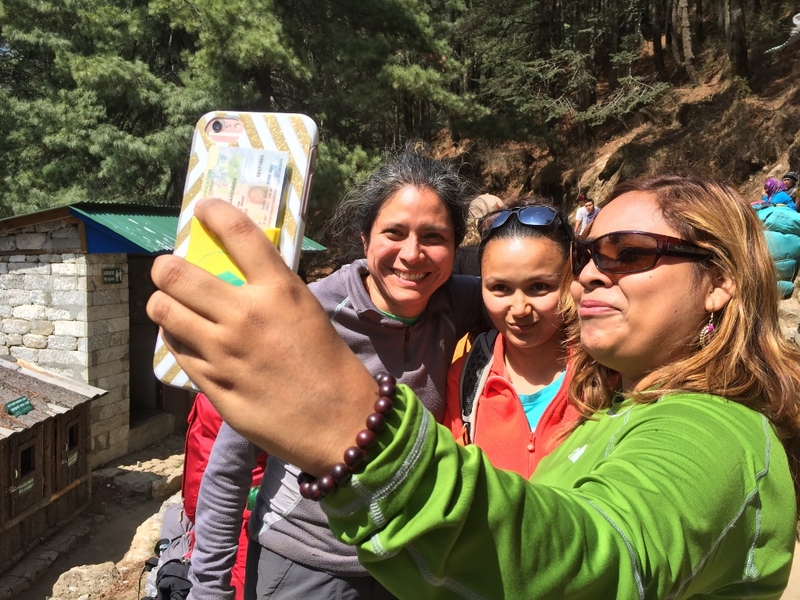 I had told Jess and Paola a lot about the Namche Bridge, which is a spectacular hanging bridge incredibly scenic. It was sweet to hear of their anticipation especially after we crossed so many bridges. Finally after our final hour of walking up and down multiple bridges, the sight of the real bridge appeared as well as their awe of that sighting. As we took our last break, we bumped into Peter and Gabe, 2 American premed students working on an altitude survey for a Harvard study. They mentioned to us that there was a female doctor in their group who was a little bit behind as she was carrying all her gear and not using a porter. 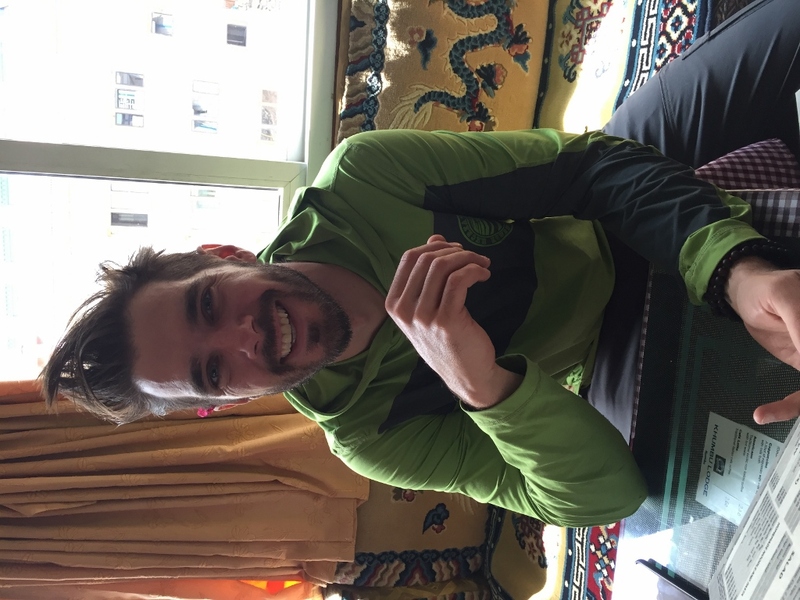 As some of us had been hit hard by altitude, I mentioned it’d be great to connect with them for the survey @ Namche as well as to speak with the Doctor. Peter and Gabe happily shared their hotel location and we all agreed to connect later in Namche once we were all settled. 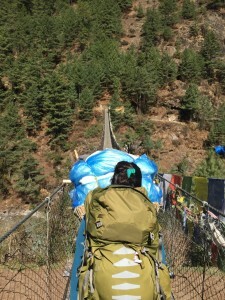 There is a long elevated steep climb to get to the beginning of this famous bridge. And it was only last November when I realized that people leave prayer flags and ceremonial scarfs (called Kata’s). 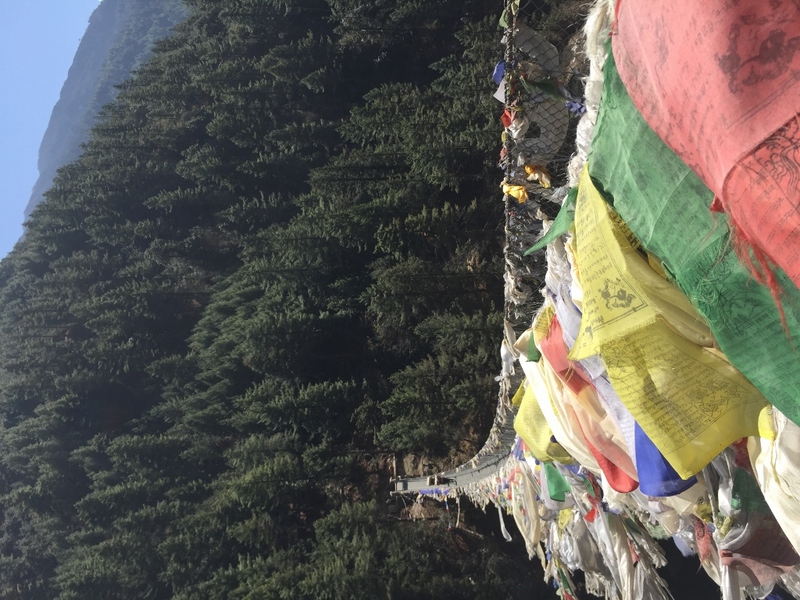 I pulled out a prayer flag and a Kata I received on my arrival and told the group that it’d be nice for us to place the prayer flag and the Kata in the middle of the bridge as an offering to Nature and the Mountains as the journey of our climbing trek was starting. 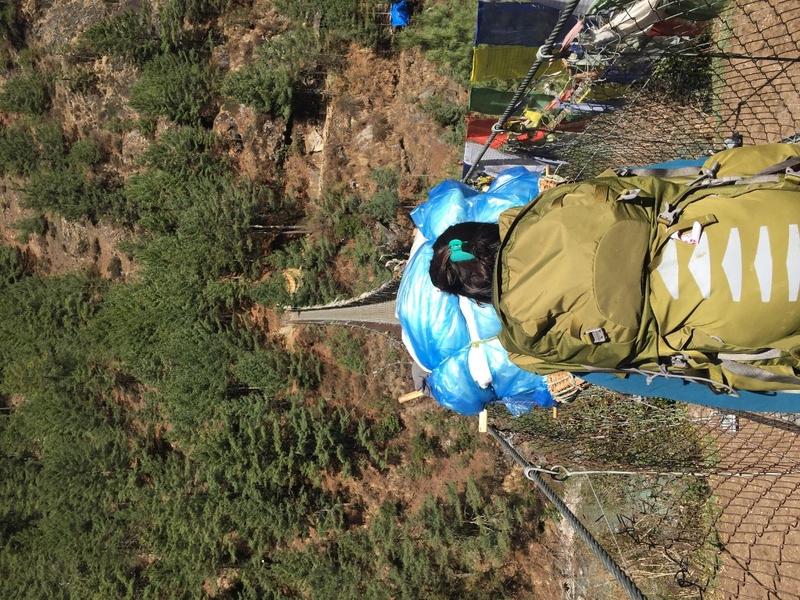 Jess took the Flag and Sunita had the Kata and as we crossed the infamous bridge, the strong winds made the experience of placing our offerings quite tricky. 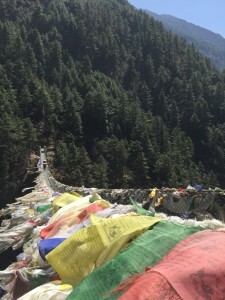 We all came together and finished tying both offerings and then continue walking towards the end of the bridge holding each other as it was really windy. 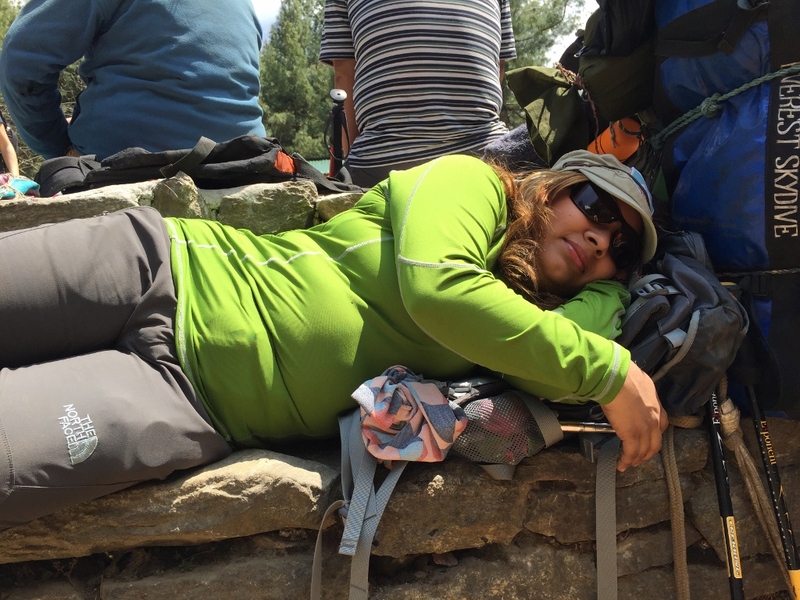 We took a long break after the bridge, ate, hydrated and then proceeded for our long climb up the lovely Namche switch back hills. The views from this standpoint are so gorgeous that taking portraits with the landscape is a must. As we started our climb, the combo of wind and sun made this quite the uphill battle. 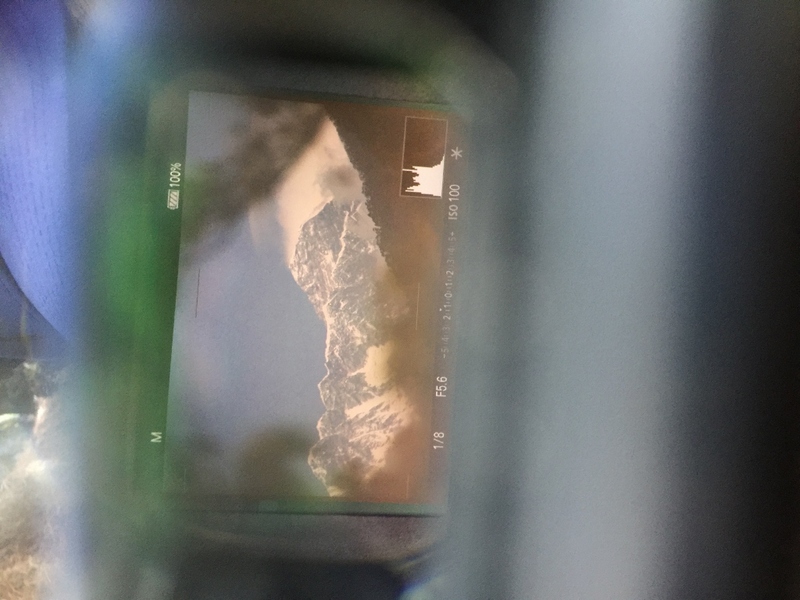 And somehow at around 20mins into our climb a special spot open up for us; there is tiny view point that can spot Everest. 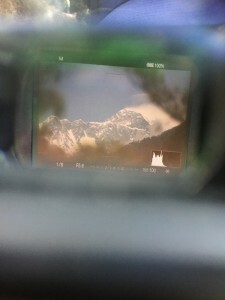 I wasn’t aware of this last time, but today, the sun was still open and the majestic view of Everest was available for us to marvel. We continued our climb and within 1hr, we stumbled across the first mandatory rest stop with proper bathrooms. During this steep Namche climb as there are no stores along the way, it was extremely pleasant to find a very smart local lady who had set up an apple and juice stand. $1 for 1 apple and $2.50 for a can of juice. Smart move as the prices were overly inflated for the local market, but with no other options for the next 90mins, you simply abide to get hydrated. Apple for everyone and sugary juices would keep our fuel going over the next 2hrs of the trek. As we got the clearance to entry Namche Bazaar, we got greeted with little children giving us flowers for exchange of candy. 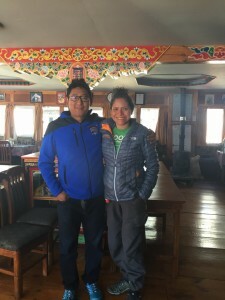 It was very special to arrive into Namche and enter the Khumbu Lodge, one of the coziest locations I’ve experienced during my travels and sweet to give a big hug to the owner, the very special Pemba. 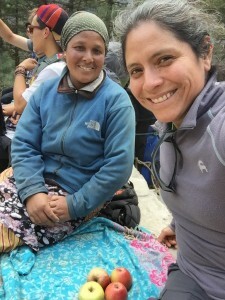 As the group rested, I walked the streets of Namche and it was sweet for me to bump into my dear friend Brazilian friend Thais (whom I met in Antarctica) and who is also climbing Everest; She was beaming face to face – she introduced me to her very sweet mom and also to her Brazilian Mountaineering guide. As we said goodbye, I bumped into another friend, Bill Allen, owner of Mountain Trip, who was en-route to Everest guiding an expedition. As we said goodbye, I also saw Manuel, the Peruvian camera man from Richard Hidalgo’s expedition – shopping for last minute items. 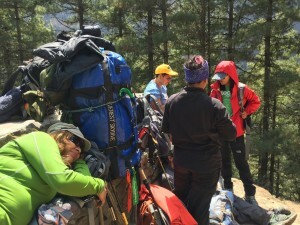 It was really sweet to start making connections and knowing I’ll be seeing familiar faces at Base Camp. 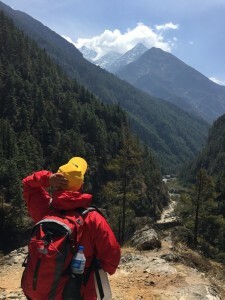 As the symptoms of the altitude were hitting some in the group, I asked Pemba (owner of Khumbu Lodge) helping me reach the hostel of the US group doing the altitude survey. As Pemba called the hostal, I got connected to the female doctor in the group, Jackie. 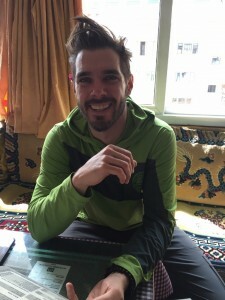 I told Dr. Jackie how I met Peter and Gabe and our interest in the survey and as I explained some of the symptoms within our group, she kindly offered to come to our hotel and check up on everyone. 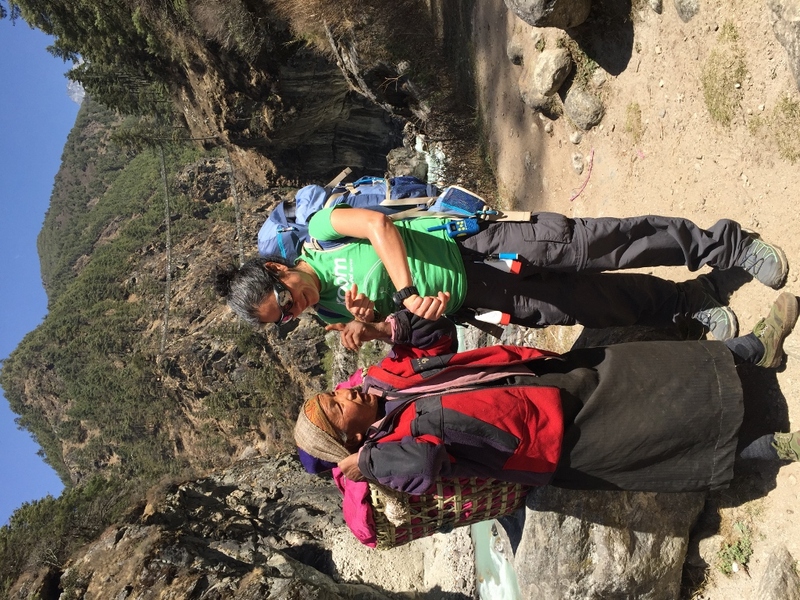 So sweet of her especially as her hotel was high up on the Namche hills. Within 30mins, Dr. Jackie was at the Khumbu Lodge ready to see all of us. 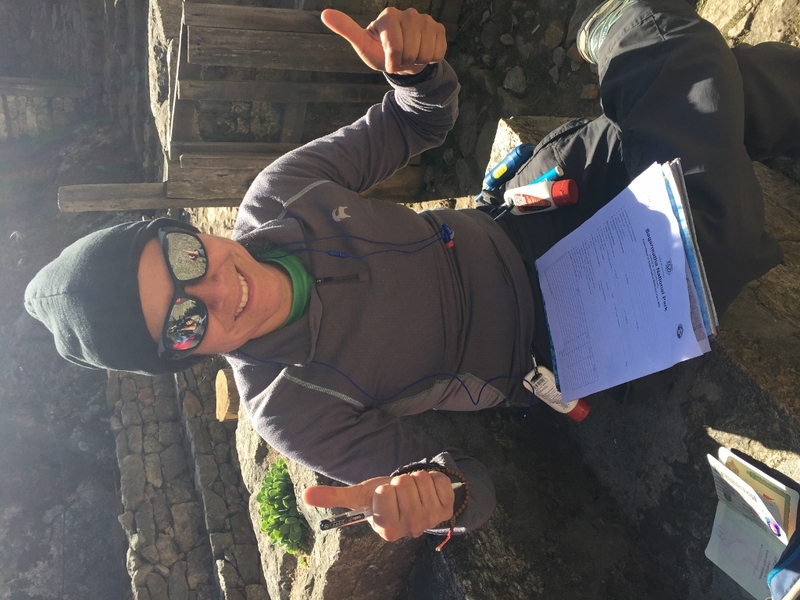 Dr. Jackie patiently examined everyone, and with laughter’s and good humor, she diagnosed some of us with “Trekkers Diarrhea” and other mild altitude symptoms and then gave me a list of various medicines to purchase. Through Dr. Jackie, we found out that caffeine was bad for altitude as well as chocolate. That was a blow for some of us addicted to strong green tea, lemon and black teas. And the chocolate news almost brought a tear in some of us (not really, but it was a close one for me). Lots of herbal teas would now have to be consumed and looking at other sweet alternatives would be the norm. We were all so moved by Dr. Jackie’s generosity, that Jess, Paola, Shawn and I took Dr. Jackie out and treated her to some ginger tea and delicious baked goods (without chocolate). We had such a fun time connecting at the bakery, that Dr. Jackie agreed to join us the next day on our hike up to Everest Hotel for good views of the Himalayas and the opportunity of acclimating. Treat for the day: The amazing generosity of Dr. Jackie!